A group in the Church of England is calling for services to address God as "She" as well as "He". 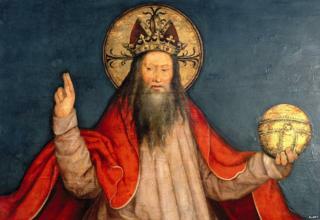 The question of God's gender goes back to the early Christian Church, writes Stephen Tomkins. The Christian Church has always had a bit of a problem with God's gender. He doesn't have one, but - as that statement demonstrates - it's hard to talk about God without giving God a gender. To talk about God we have to call God something, and avoiding pronouns altogether is cumbersome, as I've just demonstrated again. "It" seems a bit rude, talking as if God was an impersonal force like gravity or inflation. So God has to be "He" or "She", and in a patriarchal society there's no contest. As The Catechism of the Catholic Church says: "God is neither man nor woman: he is God". Other Christian groups have gone further than this though. A church in third-century Syria seems to have been in the habit of praying to the Holy Spirit in female terms. One of their holy books, the Acts of Thomas, tells of St Thomas presiding over a communion service, and calling on the Holy Spirit, saying: "Come, she that manifests the hidden things and makes the unspeakable things plain, the holy dove that bears the twin young. Come, the hidden mother… Come and communicate with us in this eucharist". Other gnostic, or mystical, Christian groups in the early Church went further from mainstream Christianity, believing that God, unknowable in himself/herself has many emanations, both male and female. The female ones include spirits called Aletheia (Truth), and Zoe (Life), and Spiritus (Spirit), Ecclesia (Church), and Sophia (Wisdom). The universe came into being through Sophia (though gnostics regarded this as a bad move) and at the end of time she will be the bride of Christ. Gnostics were baptised - according to their Catholic opponent Irenaeus - with the words: "Into the name of the unknown Father of the universe - into Truth, the mother of all things". Though this was a long way from the outlook of the established Church, Christian writing that is entirely accepted by the Church has also seen a feminine side to God. Julian of Norwich - an English recluse - in her 14th-Century Revelations of Divine Love says: "Just as God is our Father, so God is also our Mother". She talks about "our precious mother, Jesus". She speaks of the Trinity, usually described as Father, Son and Holy Spirit, in these terms: "Our Father desires, our Mother operates and our good Lord the Holy Ghost confirms". St Anselm, the 11th-century Archbishop of Canterbury, prayed to "Christ, my mother" and called God "the great mother". St John Chrysostom called Christ our "friend, and member, and head, and brother, and sister, and mother". Such ways of talking about God were only occasional until the past 50 years, when feminist theologians started to persuade churches that traditional religious language unnecessarily excluded women. As Mary Daly, for example, wrote in 1973: "If God is male, then the male is God". Since the 1980s, new translations of the Bible have used inclusive language. "What is man, that thou art mindful of him? and the son of man, that thou visitest him?" in the King James Bible, became in the New Revised Standard Version of 1989, "What are human beings that you are mindful of them, mortals that you care for them?" Most Bible translations still use masculine language for God, if not for human beings, but there are exceptions. Good as New: A radical retelling of scripture, a 2003 translation of the New Testament by John Henson and the ONE Community for Christian Exploration, calls God "your parent" rather than "your father". The Holy Spirit is a she, and though Jesus is a he, the translation avoids ever using a pronoun for God. As for the language of church services, other British denominations have gone ahead of the Church of England into inclusivity. The Methodist Church introduced a new service book in 1999 which uses both male and female language for God, "our Father and our Mother". The United Reformed Church agreed in 1984 to use inclusive language in all its publications and last year its General Assembly called on all URC congregations to use "inclusive and expansive language and imagery in worship". The question is not one to trouble polytheistic religions, with their male and female gods. It has had an impact on some parts of Judaism though. In 1975, in the US, Naomi Janowitz and Margaret Wenig produced a version of the prayer book Siddur Nashim which used female pronouns and images for God. In 1996, Gates of Repentance, the High Holy Day prayer book of Reform Judaism, was published, calling God "sovereign" instead of "king", and "source" or "parent" instead of father. There has been no comparable movement in Islam, which is less open to this kind of reinterpretation. Christianity and Judaism, however, seem to be in the process of a major continuing realignment. It is traditional for Hindus and Buddhists in Nepal to worship "Kumari Devi" - pre-pubescent girls who are believed to be the reincarnation of the Hindu goddess Durga.